This simple yet versatile paper lollipop / cake stick is a must-have for your concession stand, fair, or bakery! Thanks to its sturdy paper construction, it holds your candies and baked treats in place. This paper stick is strong enough for high speed lollipop production machines, and it can also be used to make profitable cake pops and cookie pops that your guests will love. These paper lollipop/ cake pop stick are a great value! The price for the amount you get can't be beat anywhere. My company uses these for cake pops and cookie pops! These are great for making our cake pops with! I was tired of going to the local store to get a bag of 100. Very happy that we can purchase a larger quanity for a great price. The sticks come in a sturdy box that is convenient for storage. They are the perfect height to use with the 8x8x5 boxes. We love using these sticks for our cakepops. I love using theses sticked for cake pops, chocolate pops and Oreo pops. They work great and they hold up very well. for the price you can not beet this. These work great for both homemade lollipops and cake pops. I find that the length is just perfect and still has plenty of room to hold onto when paired with the Elkay Plastics P12F0355 3" x 5 1/2" Candy Bags also sold on this site. For the quantity you get, the price is amazing!!! What a great price for this huge pack! I feel they are a little flimsy and I wish the bag were resealable but overall a good product. these sticks are GREAT for making cake pops or other dipped confectionaries. they are thick and sturdy, so you can hold larger items without worry of them sliding or breaking off, but they're paper so they're biodegradable which is awesome for the environment. i really like having them around. These sticks are the perfect length for my cake pops. The price is awesome. I was going through small packages very quickly and these will last me a while! These are nice professional looking cake pop sticks! If you make cake pops often ( or even occasionally) it’s best to buy in bulk like this! Perfect for my cake pop orders. The price is way cheaper than what I was spending at the store even with 60% coupons that I was using. I ordered 2 packs so this will keep me for a while. So glad I ordered them, no need to worry about buying them at the store. The Paper Lollipop / Cake Pop Sticks are the perfect size for a shorter cake pop. We typically offer a cake and dessert option in some of our catering packages, and along with the desert option are some cakepops for the kiddies to enjoy! These are very durable lollipop sticks. We use them for a variety of chocolate treats. From chocolate lollipops to dip strawberries bouquets. The Price is Right as well! The cake pop sticks are very sturdy. I can't believe they come with 1000 sticks for this low price!!!! They will last me a long time but now I know for sure where I will order them from again!! We love the Paper Lollipop/Cake Pop Stick in the 4 1/2 size! The sticks are sturdy and were well worth what we paid for them. We were able to transform them and use them for a salmon appetizer that was a big hit. Great sturdy sticks for cake pops and other small goodies that are dipped. Great price on how many sticks you get. Will always have these now. Because where else can you find a thousand sticks for under $8? great quality and perfect for making cake pops and custom lollipops, will definitely buy these again. These are really really great cake pop sticks, I have had absolutely no problems with them and use them regularly. Great price and quality! Thank you! These lollipop sticks are just the right size for my regular cake pops and small cookie pops. They are made of paper so can be easily cut to adjust the size. These are your standard paper lollipop sticks that are used for cake pops. I do like them. However, they do leach oil along the stick. It leave an unsightly yellow residue. These paper sticks are perfect for many different desserts. Cake and marshmallow pops come to mind but I even planned on using them for Rice Krispie treats on a stick. I have these and I have the Wilton brand. These are just as good. They're actually better because they are of the same quality for a much better price and quantity. Very economical lollipop sticks. These paper lollipop sticks are perfect for the seasoned candy maker or those just starting out and experimenting with hard candies. What a perfect little stick. It is sturdy and holds up well to cake pops as well as cookies. The price is one of the lowest that I could find especially when buying in bulk. These 4.5 inch sticks were just what i needed for my chocolate lolly pops. They are just the right size and width! and the price cannot be beat! Great for cake pops and for melted chocolate molds Sturdy and the perfect length. The price is fantastic, can't beat it. Also great for cupcake bouquet! these are the perfect size and sturdiness for cake pops and lollipops. they might be a bit small for candy apples but for lighter applications theyre great. These sticks are made very well. Very sturdy & durable. They are the perfect length for cake pops. They look great & perform even better. A much has in every bakers kitchen. I use these sticks for all my small treats (cake pops, cookie pops, brownie pops, fruit pops and rice krispy pops). Great quality and get price. These sticks are PERFECT for my cake pops. They are just the right size, not too long or too short. They are durable and work well with any candy project. I go through many stick so when I found these I couldn't believe the price for the amount of sticks. Great size for cake pop and good quality. These are the quintessential lollipop sticks for cake pops. Great quality and price! When customers think cake pops...this is what they expect. Customer for life. These are exactly what you would expect. Great value over having to purchase them in a retail store. We use them for our cake pops. Great lollipop sticks. They hold up well for cake pops and don't get all greasy. Great value and you get a lot for your money. 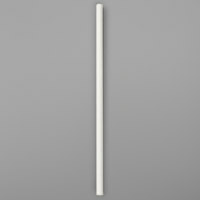 The Paper Lollipop Stick 4 1/2" x 5/32" - 1000 / Pack are a great price for a great product. I use them for cake pops and chocolate molded pops. I would purchase again. These sticks come in handy for various baking projects. I was unable to find them at any restaurant supply store. The only place you seem to be able to buy them locally is at craft stores, where they come in packs of 100, nearly the same as for 1000 at Webstaurant Store. I use these to make waffle sticks and people love them, I love the convenience of having this many of the sticks on hand and not always having to run out to buy more! These are so durable and so much cheaper than going to the craft store. Great deal! Save the gas driving to the store and messing with coupons, either way you come out cheaper buying these. These sticks are very sturdy and durable. We use them for cake pops, cookies and marshmallow pops, and they have never been a problem. They have been in the oven for cookie pops, and the freezer with cake pops, and always hold up! I will never buy another brand! Amazing! These cake pops sticks are the PERFECT size for my small business. I find that the tall cake pops are too large for my cake pops. These are perfect. These are PERFECT for cakepops and if you are like me, and you are always making cake pops, then I suggest getting these. They are so much cheaper than buying them at chain stores or even cake decorating stores. Plus, it's better quality. You cannot beat the price on these lollipop sticks! They are very high quality, and they are the perfect length for making my cake pops. Great sturdy sticks! We use them for raw vegan truffles and 'cake' pops, and so far no bends or peeling. This size is perfect for placing something 1-2" in diameter on top, and having enough room to hold the stick without fear of the item falling off or of getting messy fingers. I Love them!!! I use them to make chocolate lolly pops, candy pops, marshmallow pops, cake pops. The ideas are endless, and the price is amazing! A great product. Perfect for all caterering needs. Your imaginaton holds the key to an unlimited use for this product. Savory , sweeet, chocolate, etc. A catering must have product. These are the perfect sticks for cake pops. They are 1/2" longer than the ones we can buy retail and that 1/2" really makes all the difference. Our clients love these because there is enough room to put tags on the pops if desired. The price is incredible. We will be ordered more! I live the sticks fogey work very well for my needs and are much cheaper than the ones at the local store I use them for both my lollipops and my cake pops! I run a small cake business and one of our most popular items is cake pops - i could not believe it when i found this product here for such a great price - previously i was ordering from amazon for twice the price! not any more - thank you Webstaurant! These lollipop sticks work great! I've used them for cake pops and chocolate covered marshmallows! You can't beat the price either! Will order again when needed! I purchased these for cake pop sticks and they worked great! After i made the cake pops, I stuck them in foam and they held up great. Only thing bad about them is, they cannot get wet. Keep them away from liquid spills and you will be fine. Best deal for lollipop sticks I\'ve found so far. And I\'ve bought many in the last two years! Service is excellent (I was once shipped a broom by accident and they squared it away QUICK) and shipping is fast. I was paying a worse deal per 100 sticks. This is a great value. The sticks hold up well for making our hard lollipops. They were a very good value! The paper lollipop sticks are just the right length that I was looking for! They are very durable and don't break or weaken with use. I have a cake pop business and go through a lot of cake pops. These sticks are perfect! They are sturdy and work great for cake pops. The best cake pop sticks ever!!! Usually my cake pop sticks are so thin and flimsy and just a little bit of water ruins them. These are nice and sturdy and for a great price too!!! These are perfect for our cake pops. The product cost was cut in half buying these. They are sturdy enough and held up during transportation. I love me some cake pops so i decided to get these and try and make some and i am so pleased with how strong these sticks are! !